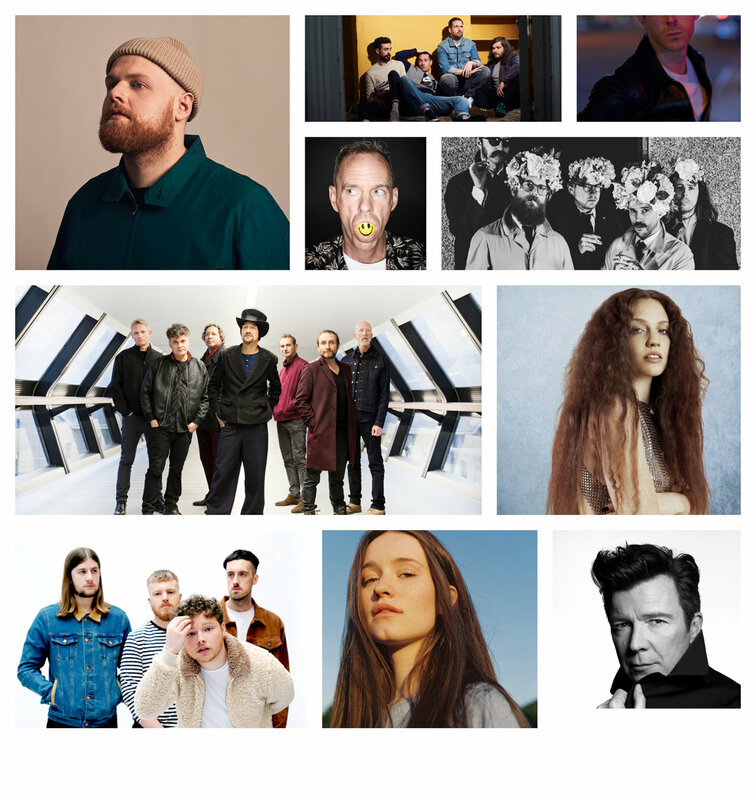 Following last year’s momentous 50th anniversary celebrations, The Isle of Wight Festival today announces the first artists for the 2019 event, which kicks off the British festival season on 13th - 16th June. The incredible Noel Gallagher’s High Flying Birds headline the opening night of The Isle of Wight Festival 2019, returning to the Festival for the first time since 2012. Chart-topping British singer-songwriter George Ezra will headline the Main Stage on Saturday 15th June, in what will be his first major UK festival headline performance, a huge milestone following an incredible few years for the 7-time BRIT-nominated artist. Special guest Fatboy Slim, making his Isle of Wight Festival debut, will keep the party going as he plays until the early hours following George’s performance. Scottish rockers Biffy Clyro bring their passionate and rousing live show to the Main Stage on Sunday 16th June, closing the 2019 Festival in what is sure to be an epic headline performance. Also joining the line-up for this year’s event are: Anne-Marie, Bastille, Courteeners, Dean Lewis, DMA’S, Freya Ridings, Gerry Cinnamon, IDLES, James, Jax Jones, Jess Glynne, KT Tunstall, Lily Allen, Madness, Miles Kane, Mystery Jets, Richard Ashcroft, Rick Astley, Sam Fender, Sigala, Sigrid, The Coral, Tom Walker and Wild Front, with Hacienda Classical returning for a second year following last year’s incredible debut in The Big Top. Tickets for the 2019 event are on sale Friday 25th January at 9am. Noel Gallagher’s High Flying Birds will take to the Main Stage on Friday evening, closing the first day of the 2019 festival in style. Since going solo in 2011, Noel has released 3 studio albums - all debuting at number 1 in the UK Album charts - and toured the world over, encompassing landmark open air shows and festival headline slots. Latest album, Who Built the Moon?, was a record-breaking 10th consecutive UK chart-topping studio album for Noel, a feat which no other artist has achieved. Arguably one of Britain's greatest songwriters, Noel and his High Flying Birds will bring an incredible array of songs to the Isle on Friday 14th June. Since bursting onto the scene in 2013, George Ezra has become one of the biggest selling male artists of the decade. His debut album, Wanted on Voyage, is certified 4x platinum in the UK and was one of the biggest selling albums in both 2014 and 2015. It hit number 1 and spent a whopping 122 weeks in the charts overall. BRIT Award nominations and worldwide tours followed, before he released his sophomore album, Staying at Tamara’s, in 2018, which shot to the top of the UK charts, becoming the best selling artist album of 2018. George returns to The Isle of Wight Festival on 15th June, having played a storming set in 2017, for what is sure to be a feel-good, finger-snapping, brass-blaring, foot-stomping show. Speaking on headlining The Isle of Wight Festival for the first time, George said: It’s been less than 18 months since I was last at The Isle of Wight Festival, but it already seems like a world away. In the time since, my second album Staying At Tamara’s has been released and I’ve taken these songs around the world and back. It’s going to be brilliant to return to the beautiful Isle and play those new songs to an audience that has now heard the record. I’m extremely flattered to have been asked to headline and can’t wait to get up and play. See you soon! Bringing proceedings to a close are Scottish rockers, Biffy Clyro, who will headline the Main Stage on Sunday 16th June. Returning to the festival after a rousing headline performance in 2014, the trio have undeniable longevity and their passion for the music they create is evident in their back catalogue spanning over 16 years. They’ve garnered countless award wins and nominations - including a Hyundai Mercury Prize shortlisting for Only Revolutions, a Q Award for Best Live Band, 2 BRIT Award nominations, 4 NME Awards wins and 4 Kerrang Award wins - and toured the world many times over. In addition, frontman Simon Neil also won the inaugural Fender Play Award at the 2018 Q Awards, which celebrates an artist at the forefront of the current guitar music scene. With 7 studio albums - including 4 which hit the Top 3 of the UK Album charts - under their belt, and an 8th in the pipeline for 2019, their soaring, anthemic hits are perfect material for festival singalongs. The band’s live show is truly stunning and fans will be in for a treat as the sun goes down on The Isle of Wight Festival 2019. Speaking ahead of headlining the Festival, Biffy Clyro said: We are delighted to be headlining The Isle of Wight Festival again. ‘Tis a beauty. Hail Satan!! Making his debut at The Isle of Wight Festival 2019 is award-winning superstar DJ and producer, Fatboy Slim, who will bring his raucous blend of house, acid, funk, hip-hop, electro and techno to the Main Stage for a special guest slot on Saturday night. A pioneer of the 90s big beat movement, Fatboy Slim has made an immeasurable impact on the British music scene, cemented in his countless award wins - including 2 BRIT Awards, a GRAMMY win for the iconic Weapon of Choice music video and an Ivor Novello for Outstanding Contribution to British Music - and his epic live shows. The UK’s biggest-selling debut artist of last year, Anne-Marie, has firmly cemented her place as one of the hottest female breakthroughs on the global pop circuit. Following the release of her gold certified and UK Top 3 debut album, Speak Your Mind, last spring, the Essex-born star is paving the way at this year’s BRIT Awards after landing four nominations for British Female Solo Artist, British Single, British Artist Video of the Year and British Album of the Year. A world-class live performer, her upcoming appearance at The Isle of Wight Festival is one not to be missed. Combining glossy ‘80s synth pop and arena-friendly choruses, Bastille have gone from strength to strength since bursting onto the scene over six years ago. Top 5 singles, number 1 albums, award wins and countless nominations - including a BRIT’s British Breakthrough Act win and a GRAMMY Best New Artist nod - have come thick and fast for the 4-piece. Never ones to dwell on downtime, they’ve kept fans engaged with Other People’s Heartache, a series of mixtapes intended to bridge the gap between the band’s studio albums. Part 4, released at the end of 2018, serves as a link between the band’s past and future, and paves the way for their third studio album to be released this year. Returning to The Isle of Wight this summer, they’re a sure-fire hit on a festival stage. On playing The Isle of Wight Festival, Dan Smith said: The Isle of Wight Festival was the first festival to have us play a Main Stage and we’ve had brilliant times playing there. We’re really excited to be back at the Festival this year to celebrate the release of our new album which we can’t wait for people to hear. Courteeners have become one of the UK’s premiere guitar bands. Hailing from Manchester, the group are childhood friends who formed in their teenage years and have seen their popularity increase exponentially since then. Through relentless gigging, early chart appearances and word of mouth hype around their hometown, they’ve produced 5 studio albums, with each one securing a spot in the UK Album chart Top 10. This summer they’ll play a mammoth, sold out headline show at Manchester’s Heaton Park, alongside James, DMA’S and Pale Waves, and eager fans snapped up 50,000 tickets in just a few hours. The Isle of Wight Festival-goers can catch them this June for a rousing, hit-filled set. Singer/songwriter Dean Lewis hails from Sydney, Australia yet with tracks Waves (which was the 2nd biggest Australian single of 2017), Be Alright and 7 Minutes he’s entered charts across the world, including the UK and US. His music has appeared on hit shows Riverdale, Grey’s Anatomy and Suits, helping him notch up over 15 million monthly listeners and over 450 million streams on Spotify. He plays The Ellen Degeneres Show this week before embarking on a tour of the US. Fans in the UK can catch up when he plays The Isle of Wight Festival this summer. ﻿DMA’S, the indie trio from Sydney that throw back to the Manchester scene of the early ‘90s, came together around 6 years ago and were signed on the strength of their home-recorded demos. Heavily influenced by Britpop icons, it allowed them to penetrate the ultra-competitive British market, succeeding where many bands before them had failed. Sophomore album, For Now, earned them 3 ARIA nominations, for Best Group, Best Rock Album and Best Independent Release. They’ll make their Isle of Wight Festival debut this summer. English singer-songwriter and the number 1 UK Independent artist of 2018, Freya Ridings experienced huge success last year following the release of her single, Lost Without You - going 6 months in the official charts, peaking at number 9 in the UK Singles Chart, it’s now gone platinum and was subsequently chosen by Radio 1 DJ Scott Mills as his Tune of the Week. With a sold out tour approaching this March, Freya’s had support from Sunday Times Culture, GQ, Evening Standard and Music Week. 2019 is Freya’s for the taking. On making her Isle of Wight Festival debut, Freya said: I’m so excited about playing The Isle of Wight Festival this year - there are so many amazing artists performing and to be part of such a great line up is a dream come true. Gerry Cinnamon’s music crosses generations in a way that only a handful of wordsmiths can - relatable, relevant and a true story teller. Unsigned and unmatched in his ability to operate outside of the mainstream Gerry has become a cult hero and force to be reckoned with. His upcoming UK and Ireland headline tour continues his legacy of selling out shows in minutes. His hugely anticipated self-produced, self-released debut album Erratic Cinematic rocketed to the top of the iTunes album charts on release with little more than a social media post, holding off some of the biggest names the industry has to offer. His anthemic tracks, laced with social commentary, have captured the imagination of audiences up and down the country. Gerry is more than an artist but a phenomenon, paving the way for the next generation of DIY pioneers. The awards, sold out shows and reaction to his critically acclaimed debut album has not only propelled him to the next level but affirmed his place as a writer as well as a live act. On returning to The Isle of Wight Festival, Gerry said: Looking forward to playing The Isle of Wight Festival again. Class line up - if I wasn't playing I'd probably be going. Now in its fourth year, the widely acclaimed Haçienda Classiçal returns to the Isle with a new set for 2019, curated by DJ Graeme Park, Executive Producer Peter Hook and Musical Director Tim Crooks. They will again reinterpret seminal dance classics from the hugely influential Manchester club, alongside the city's Manchester Camerata orchestra. These inspirational nights recreate the tunes that defined a generation with a powerful, poignant and electric performance. The team behind Haçienda Classiçal, said: I can't wait to return to The Isle Of Wight Festival with Haçienda Classical. Last year was absolutely amazing and I'm really excited to be returning again this year with our brand new 2019 show. This is going to be incredible! (Graeme Park). British band IDLES have had an incredible two years: their stunning debut album, Brutalism, was released in 2017 to critical acclaim, with their follow up, Joy as an Act of Resistance, propelling them to new heights. Released in 2018, it reached number 5 in the UK Album chart and received critical acclaim from The Guardian, NME, The Independent and Classic Rock. Ending 2018 on many industry lists - including securing the top spot on BBC 6 Music’s Top 10 Albums of 2018 - and kicking 2019 off with a BRIT Award nomination for British Breakthrough Act, they are the band on everyone’s lips. They bring their engine-like drive to The Isle of Wight Festival this June. James are one of the UK’s most creatively restless and most loved artists. After signing to Factory Records in 1982, the band went on to release a series of successful hit singles. From Sit Down to She’s A Star, Laid to Come Home, Moving On to Nothing But Love, their uniquely diverse sound spans 15 studio albums released over three decades, achieving both critical and commercial success whilst also curating a base of dedicated fans and selling over 25 million albums worldwide. 2018 they released the Top 10 album Living in Extraordinary Times and played some of their biggest ever shows in the UK and across the globe, cementing their status as one of the most iconic live British bands. On returning to The Isle of Wight Festival, Jim Glennie (bassist) said: It's great to be back playing The Isle of Wight Festival - it will be our fourth time. Lots of happy memories of not just performing but of seeing great bands too. Looking forward to it. Since his first foray into the UK charts back in 2014, Jax Jones has become an international, multi-platinum-selling artist with singles like You Don’t Know Me, Instruction, Breathe and Ring Ring becoming bonafide chart, radio and streaming hits — and there are more to come. The last four years have seen Jax quietly becoming one of the British music scene’s most creative writers and producers, working with artists as diverse as Tinie Tempah and Clare Maguire and sprinkling a bit of the old JJ magic on remixes for the likes of Charli XCX, Years & Years and Missy Elliott. Add that all together and it’s clear that he’s a legitimate genre-hopping pop genius. Jax said: The Isle of Wight Festival has an incredible history and has hosted some of the greats, so I’m looking forward to being a part of it this year. Gonna be bringing something special for this one, for sure. ﻿In her first few years in the music industry, Jess Glynne has carved out a unique slot all of her own. Where others were contemplating the aftermath of heartache, she has always been about standing on your own two feet. Through her blockbuster debut album, I Cry When I Laugh - which was a chart staple for 138 weeks, debuted at number 1 and spawned 12 million worldwide single sales - and sophomore offering, Always in Between - released last year and also debuting at number 1 - she brokers the hinterlands between pop, soul, R&B and house music. She holds the record for the most UK chart-toppers for a British female singer, and has nominations aplenty, adding a further two BRIT Award nominations to her name earlier this month. Since scoring a worldwide smash with her debut album Eye To The Telescope in 2004, which went on to sell over 5 million copies, KT Tunstall has remained at the forefront of UK singer-songwriter talent. Over the next decade, three further critically acclaimed albums followed, keeping the platinum sales rolling and cementing the Scottish singer-songwriter’s reputation as a major recording talent, as well as a mesmerising live artist. Throughout her career she’s won a BRIT Award (British Female Solo Artist), Ivor Novello (Best Song), Q Award (Track of the Year), plus earned a GRAMMY nomination for Best Female Pop Vocal Performance. 2016 hailed the arrival of the first of a trilogy of albums, the critically acclaimed UK top 10 album, KIN. The trilogy evokes, separately and in sequence, spirit, body and mind. With KIN being her phoenix-from-the-ashes 'spirit' album, 2018 saw her release the second offering of that trilogy, WAX, her 6th studio album. 12 years after British pop star, Lily Allen, released debut album, Alright, Still - which entered the UK Album charts at number 2 - she returned in 2018 with arguably her most honest, emotional and artistic body of work to date. No Shame received critical acclaim from The Telegraph, NME and The Guardian, to name but a few, and was nominated for the 2018 Mercury Prize. On it, she embraced a more intimate, electropop sound, collaborating with Giggs, Mark Ronson and more. Fans can catch her at The Isle of Wight Festival this summer. A British institution, legendary band Madness also join the bill today, bringing their bold and energetic sound to the island this summer. Emerging from the punk, reggae and ska scenes of the late ‘70s with a string of classic singles and albums, Madness continue to be one of the country’s most loved bands. To this day they continue to influence new generations of musicians and maintain a reputation as one of the most consistently entertaining live acts. ﻿Miles Kane is a man with many strings to his bow. Whether it’s his Mercury Prize-shortlisted work as The Last Shadow Puppets (alongside Arctic Monkeys’ Alex Turner), his success as a solo artist in his own right or more recently his fashion collaborations with Fred Perry - Miles never stands still. His recently released third solo album, Coup De Grace, his first in 5 years, was a top 10 hit in the UK and the accompanying rip-roaring live show is second to none and one not to miss. Indie rockers, Mystery Jets, released their debut album and since then, their ability to craft an indie anthem has gone from strength to strength. From Making Dens (2006) through to Curve of the Earth (2016) they’ve pushed themselves to continually create music beyond their parameters. They continue to be a major player on the London music scene with their distinctive brand of bright, indie pop. They return to The Isle of Wight Festival this June. Rivetingly charismatic, menacingly serpentine and possessed of an almost shamanic intensity, Richard Ashcroft embraces and articulates the anthemic fervour of rock’n’roll with a power and eloquence unparalleled by any of his contemporaries. His fifth solo studio album and most recent body of work, Natural Rebel, represents the latest chapter in a hugely successful solo career for the former Verve frontman and Ivor Novello winner, and debuted at number 4 in the UK Album charts. He delighted fans with a surprise support slot at Liam Gallagher’s Finsbury Park show in 2018, and will grace The Isle of Wight Festival stage this summer. If you think you know Rick Astley, think again. The much-loved, multi-million selling 80s icon returned to the charts in 2018 with the release of his stellar album Beautiful Life, which debuted in the UK Album chart Top 10, the fifth album of his to do so. He appeared at the Royal Variety performance (alongside Saturday headliner George Ezra) and appeared onstage with Foo Fighters during their headline performance at Japan’s Summer Sonic Festival, resulting in a live RickRoll courtesy of Dave Grohl and co. Rick joins Take That on their mammoth UK arena tour in 2019, including 8 nights at The O2 Arena and 5 nights at Manchester Arena. On playing the festival, Rick said: I am so excited and I still can’t believe that I can say to people, ‘I’m playing the Isle of Wight Festival. I can’t wait! Nor can we Rick!